U.S. Senator Robert C. Byrd, books and BACK TO GODHEAD in hand, tours Prabhupada’s Palace of Gold with Mahabuddhi dasa, the general manager for the Palace. New Vrindaban, West Virginia—When U.S. 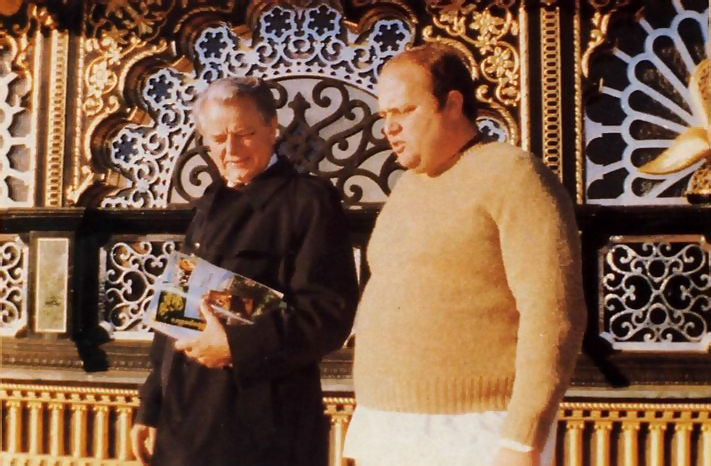 Senator Robert C. Byrd (D., West Virginia) visited his home state this past November, he took a tour of Prabhupada’s Palace of Gold, the Hare Krsna showpiece in the West Virginia hills. Senator Byrd said it was too bad he’d heard of the Palace only recently. Otherwise, he said, he could have brought with him the other Democratic Senators who had visited West Virginia with him the month before. 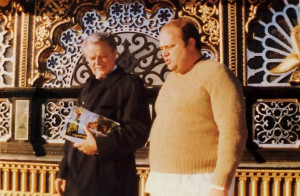 Senator Byrd inquired about the religious background of the New Vrindaban Community, where the Palace is located, and took with him a copy of Bhagavad-gita As It Is. This is one of about sixty books by His Divine Grace A.C. Bhaktivedanta Swami Prabhupada, in whose honor the Palace was built. Shaking hands with other Palace tourists, Senator Byrd met one couple from New Jersey. “We came to see the Palace after we saw it on TV,” they said. “What do you think about it?” the Senator asked. “Every year the Hare Krsna devotees celebrate the festivals of Diwali and Govardhana-puja with complete devotion. Diwali, related to Lord Rama, reflects the joy and happiness expressed after His coronation in Ayodhya. Govardhana-puja is related to Lord Krsna, who lifted Govardhana Hill on His finger just to save the cowherd community from the fury of Indra. These festivals and many similar ones show that Lord Rama and Lord Krsna have had a great impact on the cultural life of India. Indeed, it is as if the mainstream of Indian life flows between the Ganges of Rama and the Yamuna of Krsna. “King Bhagiratha brought the Ganges to earth for the welfare of mankind, but sometimes I think Srila Prabhupada brought both the Ganges and Yamuna by chanting the mantra Hare Krsna, Hare Rama—not only for America but for all humanity. The Indians abroad are obviously included. Srila Prabhupada was not only a profound scholar of our sastras [scriptures] but also a great devotee. He lived the life he preached. 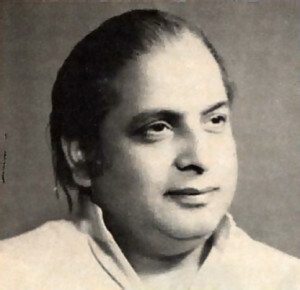 He has shown the world that the only path to salvation, or mukti, is to become a complete devotee of Lord Krsna by dedicating everything to Him and remembering Him at every moment. This is the essence of Lord Krsna’s teachings. “By the grace of God I am a humble world traveler, and I am very happy to see the devotees and temples everywhere in the world. Srila Prabhupada was instrumental in bringing East and West together—an impossibility (according to Kipling) made possible. 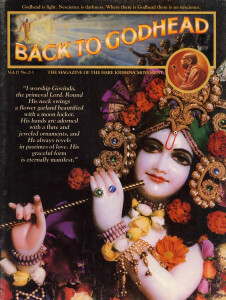 “Creating the spiritual world of the International Society for Krishna Consciousness was a unique human achievement. Srila Prabhupada came to America in 1966, and in the short span of fifteen years his holy mission made a worldwide base. In the whole course of human history there is no other example of a religious movement making such a tremendous impact on mankind in so short a time. The success of ISKCON, which seems to have been destined, is the greatest miracle of the modern world. “Srila Prabhupada was not an ordinary human being: he was a direct messenger of Lord Krsna. He shined the light of God where there was darkness all around—the darkness of ignorance and material desires. In my humble view the secret of his success is that he never compromised his principles and ideals, as given by Lord Krsna. How could there be a compromise between truth and untruth, between the pure and the impure? He thus set the best example for modern spiritual preachers. For the best results in spiritual life, he insisted, one must practice and preach the genuine science of God. “If God were to come in person, many would still doubt Him. Similarly, many people with conditioned minds still nurse misunderstandings about this movement of pure bhakti, pure devotional service to God, even though the Bhagavad-gita says, samsayatma vinasyati: “a doubtful mind invites destruction.” The sun has risen, but still people have doubts. “Have you done enough research to prove it is genuine?” they ask. Ignorance is often used to challenge knowledge, and sometimes when ignorance begets a majority, knowledge feels isolated. But if those with true knowledge have determination and faith—i.e., sankalpa-sakti—nobody on earth can defeat them. God is always with truth; that is why truth prevails. I am sure the devotees have no doubts about this. Success is bound to come. 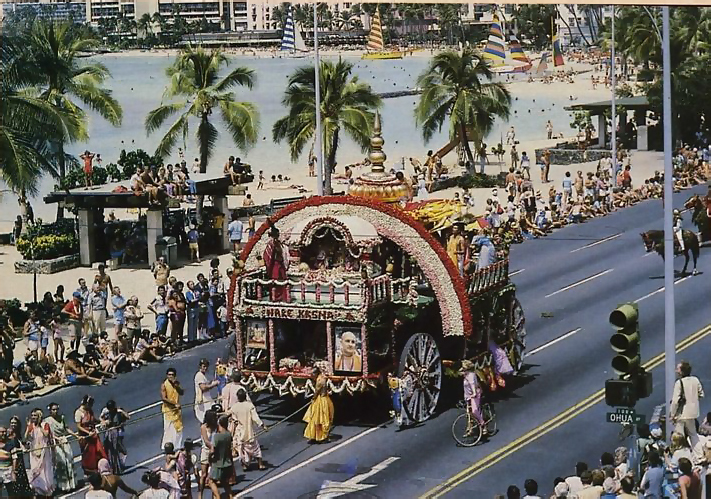 Honolulu—Resplendent beneath a rainbow of 40,000 red, white, peppermint, and pink carnations, followed by thirty-three marching bands, equestrian units, and floral floats, and ushered in by an entourage of twice that many. 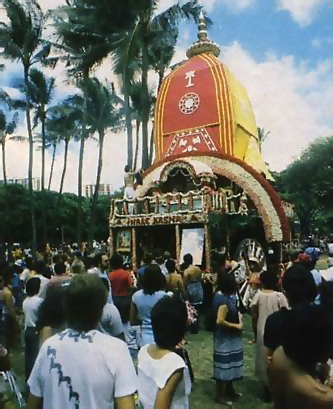 Lord Krsna and His devotees celebrated Honolulu’s fifth annual Ratha-yatra Festival. 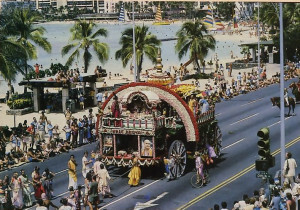 Thus it was that 100,000 spectators and a television audience of 500,000 smiled, waved, and cheered as Lord Krsna’s devotees pulled His chariot in the three-mile procession, heralded by a majorette whose blue banner announced Lord Krsna’s float to be an official prize-winning entry. When the parade ended, the Hare Krsna festival continued in Kapiolani Park. There the devotees chanted Hare Krsna and profusely distributed prasadam, food first offered to the Lord. Mayapur, West Bengal—On March 1, Krsna devotees from around the world will gather to honor Lord Sri Caitanya Mahaprabhu, who appeared here nearly 500 years ago to teach the sublime chanting of the Hare Krsna mantra. The devotees will also journey to Vrndavana, the place most sacred to Lord Krsna.